About his project: "Back in the nineties of the last century in Ryazanschina (Ryazan region) it was impossible to find someone who would be able to work with wood. Nothing to catch hold at all. Then we decided to go on this way: Invited labor teacher of a school, gathered children and slowly began to recover this ancient craft. And today we can speak about a specific industry in which hundreds of people are employed. Any man from the street can come to us and say: I want to do wood carving, give me three boards – he wouldn’t get a denial. Please, take it and do it. And if it is good and beautiful, we will offer that person to duplicate the work. Any nation, if it wants to remain on the land, is obliged to protect national traditions with the same selflessness with which to protect its borders. Groshev Vladimir Pavlovich was born on January 20, 1940. In 1957-1963 - a student of the Faculty of Physics and Technology of Tomsk Polytechnic Institute he has received a specialty "nuclear facilities engineer." In 1963-1967 - He worked as a senior lecturer at the department of political economy at Tomsk Polytechnic Institute. Then he was transferred to the apparatus of the Central Committee of Komsomol. After graduating from the Academy of Social Sciences under the CPSU Central Committee he became the chief editor of "The Student Meridian". In 1977-1980 - In charge of the agitation and propaganda department of the Central Committee of Komsomol. After defending his doctoral dissertation he became the deputy head of the department of economics and organization of production of the Academy of Social Sciences. In 1980-1987 – he worked in the Central Committee of CPSU. In 1988 he became one of the founders and leaders of "Inkombank". The newspaper "Izvestia" (11 April 1995): "Immediately after the law "About Cooperation" and guidance letters to the Ministry of Finance and the State Bank, which lets you create mutual banks, that is, as soon as there was a legal possibility to establish a commercial bank, the president of "Inkombank" Vladimir Vinogradov, in recommendations of an economist Leonid Abalkin, turned up with this idea to Vladimir Groshev. Groshev, in turn, actively supported this idea. Since May, 1990 - President of the Union of managers, the president of the Russian Managers Association. Chairman of the Board of joint-stock bank "Inkombank". In 1992 - a member of the Council of Entrepreneurs under the President of the Russian Federation. Since 1992 - President of the Academy of Management and Market. Since 1993 - Chairman of the Board of Directors of voucher investment fund "Inkomfond". In December 1995 - he stood for the State Duma of the electoral association "Our Home - Russia" in single-mandate constituency № 150 Shilovskaya (Ryazan region). Among the pre-election key points he put forward an investment program ($ 4 trillion. Rub. ), which included the development of agricultural processing facilities in the Ryazan region. 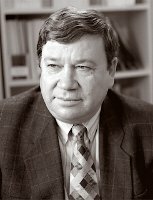 In the elections, according to Groshev against him were active Communists, who called him "Shark" and "money bag" (Bulletin of the Institute of Humanitarian and Political Studies, 16 April 1996). According to the results of voting Groshev lost to the candidate from the Agrarian Party of Russia S. Enkov. Chairman of the Board of Directors of JSC "Samara Metallurgical Company" (SAMEKO, Volga region). May 1996 – he became a member of the National Economic Council, established at the First Russian Economic Forum in Yekaterinburg, and conscripted to become a "co-ordinator course of market reforms in Russia." 9 July 1996 - Russian Security Council Secretary Aleksandr Lebed made a statement about his intention to persuade the President to appoint a deputy, Vladimir Groshev Security Economic Security Secretary. Groshev candidacy was proposed by Lebed at the meeting of the Security Council Secretary with the most prominent economists and businessmen in the Plekhanov Institute in July 9, 1996. Chairman of the Board of Trustees of the Russian Economic Academy named after Plekhanov. Vice-President of the Moscow International Business School "MIRBIS". Founder and patron of Meshchera museum of wooden architecture and inter-school craftsmen (Ryazan region., Klepikovsky district, der. Lunkino). Died May 3, 2009 buried in Klepikovsky District of the Ryazan region. Two children. Doctor of Economic Sciences. Professor. Honorary citizen of Klepikovsky District of the Ryazan region. In 1994 - he was in the list of business leaders, published in the book "Leaders enter the Russian business", published by the Institute of Applied Politics, ranked sixty-fifth place. The newspaper "Izvestia" about Groshev (12 July 1996): "Groshev is known to the world not only as a scientist-macroeconomist, but as a prominent organizer of economic education in the country, today his students play quite prominent part in domestic business."